It is Sunday in Edinburgh and the city streets are filled with Frenchmen in blue shirts and black berets all come for the Six Nations rugby match against Scotland at Murrayfield stadium. Preferring the game that favours a more spherical ball it seems like a good opportunity to take the train to Glasgow for the day. The previous day, on our mentioning Scotland’s largest city, Colin, our bed and breakfast host, remarked, “Well, I’m Edinburgh man so I’m biased but I think Glasgow makes the most of what it’s got to be fair.” It is no secret – Edinburgh and Glasgow may be less than 50 miles apart – one hour on the train – but there is a cultural gulf between the two cities. Or so they would have you believe: rough, working class Glasgow versus genteel, middle-class Edinburgh; Billy Connolly versus Miss Jean Brodie; deep-fried pizza versus herb-infused foccacio. This is, of course, a misleading generalisation but it cannot be denied that the two cities do have a markedly different feel. Edinburgh is no longer ‘Auld Reekie’ but a stylish European capital with a beautiful skyline. 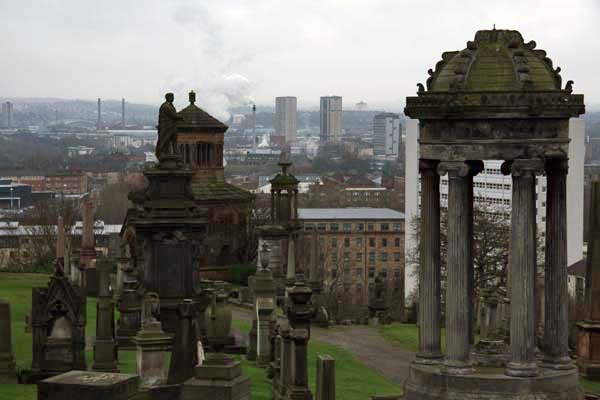 Glasgow, on the other hand, remains a Victorian city par excellence – famously, the second city of the British Empire. While Edinburgh seems to thrive on its glorious past and embody the spirit of the Georgian Enlightenment, Glasgow, like Manchester and Sheffield over the border in England, is a place in post-industrial transition, a city trying to find its rightful place in the 21st century. Despite its City of Culture makeover a decade or so ago, Glasgow still manages to look a bit threadbare around the edges in a way that central Edinburgh does not. This is only part of the picture though – take a bus out to one of the outlying ‘schemes’ in either metropolis and peripheral Edinburgh looks every bit as unattractive and dysfunctional as the wastelands of outer Glasgow. 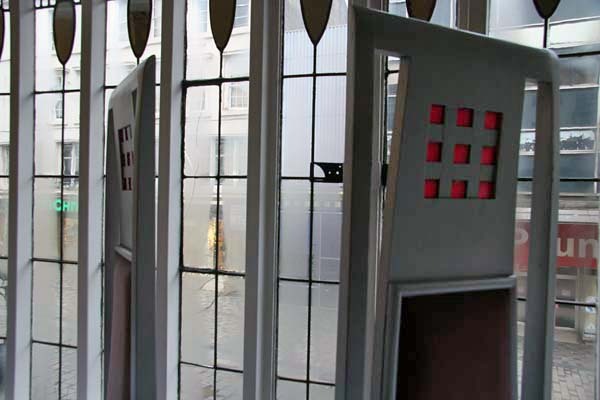 In Glasgow, the Willow Tearooms still operates in the city centre, a working shrine to the distinctive secessionist style of Charles Rennie Mackintosh, one of the city’s most famous sons. The Glasgow School of Art designed by Mackintosh when he worked as an architect in the city lies just around the corner. 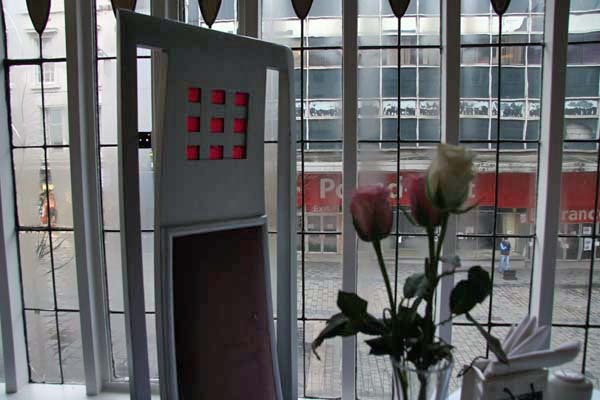 The ‘Room de Luxe’ at the top of the stairs is a delight – elegant high-backed chairs, roses in vases and a view through stained glass windows down onto Sauchiehall Street below. The window glass (original we are told) distorts a little, affording a slightly twisted view of a boarded-up Pound-Mart store opposite, humdrum 1960s and peeling paint. A solitary busker, clearly audible from the tearoom, plays the trumpet to passers-by, belting out jazz standards like Summertime in fast rotation. But summertime it is not – the day is dreich and chilly, the sky the colour of cold porridge – Gloomy Sunday might be a more apposite choice. We climb the path to the top. Low cloud has drained all colour from the view apart from that of the glowing rust brown of the neo-Norman Monteath mausoleum, which brings to mind an Armenian church but was apparently modelled on the Knights Templar Church of the Holy Sepulchre in Jerusalem. 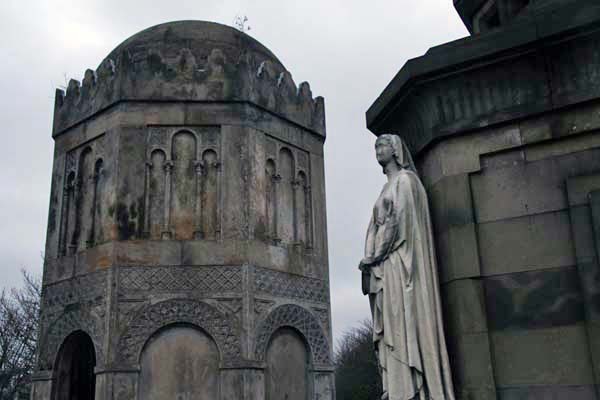 Further up, the William Rae Wilson mausoleum is decidedly Moorish, a fitting monument to someone who travelled and wrote about the Middle East. Next to this, the entrance of the Graeco-Egyptian mausoleum of John Houldsworth is flanked by stern white angels, Hope and Charity, while Faith lies within glowing almost praternaturally in the gloom. The view is the thing here. From the vantage point of the Necropolis it is easier to grasp the scale of Scotland’s largest city, even on a dull day such as this. The concrete, brick and stone of the city centre sprawls to the west beyond St Mungo’s spire and buttresses. Elsewhere, the land dips and rises gently to trace the valleys of Glasgow’s rivers, the Clyde and Kelvin. High-rise housing schemes dot the horizon east and north, an architectural echo of the serried ranks of tombs that line the Necropolis thoroughfares – a world of folk that once belonged to Glasgow’s inner city but now find themselves detached and isolated. If you believe the clichéd image, a realm of ne’er do wells – bampots, malkies, and chiv-wielding neds – but also pensioners, terminally unemployed steel workers, young single mothers and beleaguered immigrants. Whatever the reality, it is a long way from the fancy designs of Charles Rennie Mackintosh and certainly no place for Wee Willie to wander alone at night. Heading back to Edinburgh our train squeezes past another returning to Glasgow at Croy station. Not quite as crowded as those we saw heading for Edinburgh on the way there, its carriages are full of middle-aged men in kilts and Scotland rugby shirts. They look somewhat subdued – clearly Scotland has lost the rugby. 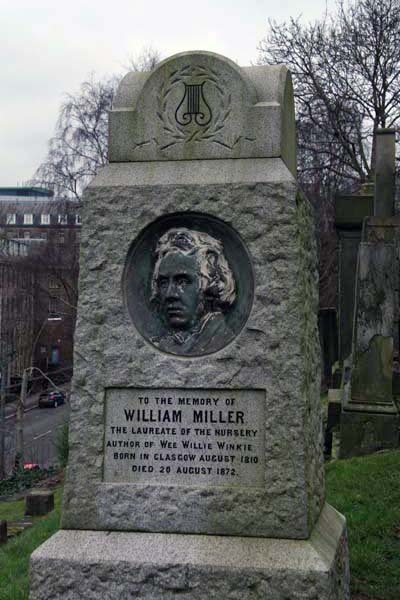 This entry was posted in Literature, Scotland, Travel and tagged Charles Rennie Mackintosh, Edinburgh, Glasgow, graveyards. Bookmark the permalink. It’s probably a bit harsh to say that Edinburgh people are stuffy – although they have more of a reputation for this than Glaswegians. Edinburgh is certainly expensive around its tourist hotspots – Princess Street and the Royal Mile – but elsewhere it is pretty much like any other city in the UK (apart from London, which is much more expensive).